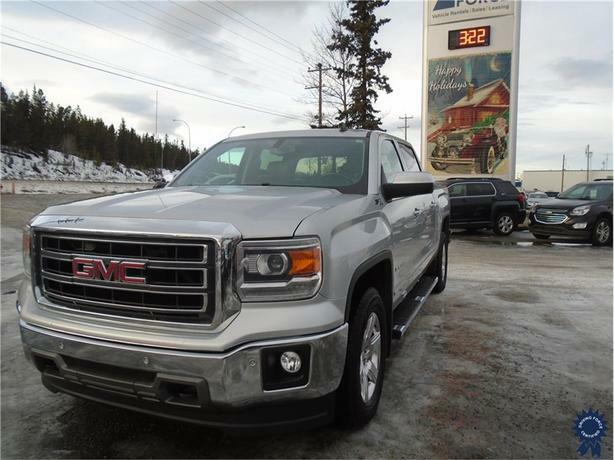 This 2014 GMC Sierra 1500 Crew Cab 5 Passenger 4X4 6.6-Foot Medium Box Truck comes with a 153-inch wheelbase, 6-speed automatic electronically controlled transmission, 3.08 rear axle ratio, 18-inch polished aluminum wheels, 8-inch Color Touch Screen with AM/FM/SiriusXM satellite capable radio, USB ports, auxiliary jack, SD card slot, Bluetooth for phone, hands-free smartphone integration, voice-activated technology for radio and phone, engine block heater, platform running boards, rear-window electric defogger, backup camera, cruise control, front tow recovery hooks, remote engine start, and GWVR rating of 7,200 lbs (3,266 kgs). The 5.3-litre EcoTec3 V8 gas engine with Active Fuel Management provides 355 horsepower at 5,600 RPM and 383 lb-ft of torque at 4,100 RPM. Touch base with us to discuss purchasing or financing options that are right for you and experience the difference you will only find at DRIVING FORCE Vehicle Rentals, Sales and Leasing.